The gag reflex is a natural part of the human body, yet some people have a much more sensitive gag reflex than others. The soft palate in the back of the mouth is extremely sensitive. If something touches or gets near this palate, the irritation evokes a feeling that you are going to vomit. There are different levels of sensitivity among people, but those with an overly sensitive gag reflex often avoid the dentist because they are fearful that they will not be able to handle anything put into their mouth. It is important to understand that putting off dental visits is dangerous to the health of your entire mouth. Just because you have a sensitive gag reflex does not mean that you cannot receive successful dental care. There are ways to alleviate your gag reflex to ensure that you are able to receive positive and comfortable dental care. Talk to your dentist! Your dentist wants to be able to provide the dental care that you need for a healthy mouth. A sensitive gag reflex is actually quite common, and dental hygienists and dentists are able to provide more specific approaches to cleaning the teeth when they know upfront that a sensitive gag reflex is of concern. Breathe through your nose. Focus on breathing through your nose during any dental procedure. Not only does keeping your focus on your breathing help to distract your brain, but it is also likely to reduce the chance of a psychosocially induced gag reflex from occurring. Distract yourself. Watching TV or listening to music often helps the brain become focused on something else so that you are distracted from what is going on inside your mouth during a dental visit. Request afternoon appointments. Studies show that a person’s gag reflex is often more sensitive in the morning because the body is more awake. Scheduling an afternoon dental appointment, when the body is more relaxed, can often help prevent the gag reflex from being too active. Watch your posture. Sitting up straighter provides more room in the back of the throat. Ask to adjust your dental chair so that it is most comfortable for you. Ask about sedation dentistry options. 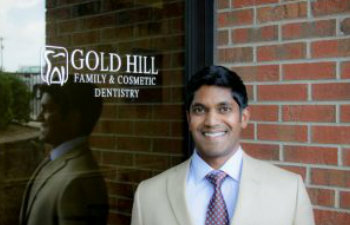 At Gold Hill Dentistry, we never want anyone to neglect their oral health because of a sensitive gag reflex. This is nothing to be ashamed of, and it is common in adults and children. We want you to be comfortable. Talk to us!